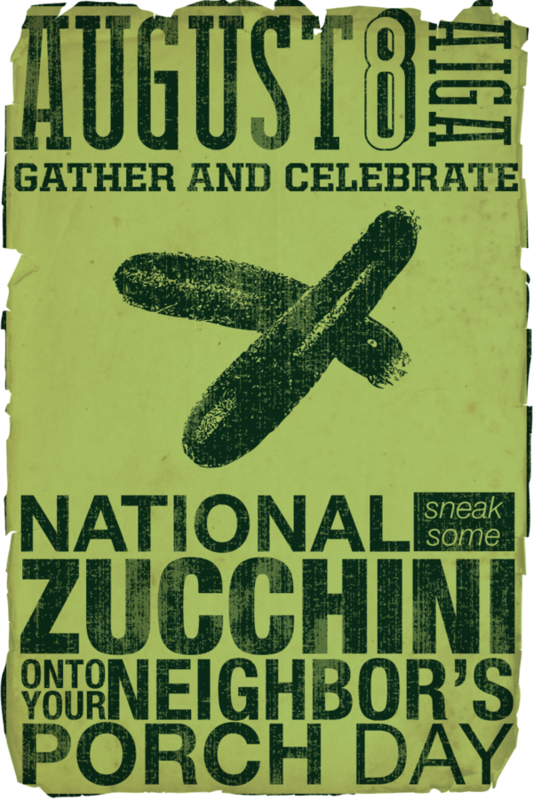 Sneak Some Zucchini Onto Your Neighbor’s Porch Day. Now that’s nasty! But hey, what are you going to do with an endless supply of zucchini fruit? Experienced gardeners know that Zucchini is one of the most prolific plants in all of the gardening world. A single plant produces a seemingly endless supply of Zucchini. A small row of zucchini has the potential to end world hunger. By the time August arrives, gardeners are reaping far more zucchini than they can possibly use. They use it daily in an untold number of recipes, from soups and stews, to breads and dips. Still, the fruit matures on the vine faster than anyone can even pick it. Zucchini growers become desperate, as they try to give zucchini away to family, friends and everyone they encounter. By August, even non-gardeners have had enough. Everyone avoids you, with your arms laden with giveaway fruit. Desperate times calls for desperate measure. It’s time to sneak over, under the cover of darkness, to your neighbor’s porch, and unload some zucchini. August 8th is that day. This may solve your problem for that day, but, what will you do with the harvest tomorrow!? !